Robert Bresson is an intensely Catholic director whose sensibilities, unlike those of most of his French peers and colleagues, seem more aligned to the existential stillness of Ingmar Bergman or Carl Dreyer, a tradition imbued with the spirit of the still life. His is a world where the density, or intensity, of surface is scoured to reveal what would be ‘otherwise’, where this otherwise is not reducible or defined by psychology or any of the other narcissistic sins of our late modem world. So, in the world of L’Argent, the world is fallen, always fallen, and redemption is never available in or from it. Grace, a divine gift (and Bresson’s vision of grace explicitly obeys a radical economy of the gift) is arbitrary and unknowable, constituting an outside that can never be deduced from the events or causes of a particular narrative. This is, perhaps obviously, the major difficulty audiences have in approaching Bresson’s work. We are, for better or worse, conditioned by what we think narrative cinema is, and when we meet a story that disregards this, that even quite actively refuses us the pleasures of reason, our attempt to escape via the secular inevitably fails. We always walk out asking “why?” or even “I don’t get it”, not recognising that the cause for what has happened is not within the characters, and certainly not of the quotidian, nor even of what we might ordinarily define as ‘reason’ to be. On the other hand, this is plainly not an escape into the irrational, surreal, or some ‘soft’ eschatology of the deserving. Sacred cause and action is outside of reason, this is one of its sacred aspects, and will always remain mysterious. In Bresson’s world we are fallen too. This lack of reason is also evident in more simple ways in the film, through what might be described as the film’s unreasonableness. In its manner of address the film performs, in relation to us, the same distance and immutability that is represented in the film’s narrative. It offers little by way of narrative pleasure – for example we cannot identify with the characters through their acting as it is deliberately evacuated of expression and individuality – while the film’s minimalist style replays the film’s critique of the vanity of what might be termed ‘style’. (Notwithstanding that a refusal of style can always be recovered as a style.) We are not to be accomplices in the story, nor are we its equals. Indeed, I suspect it could be that we are not even allowed or permitted the possibility of judgement in any ordinary sense (is it ‘good’ acting, why does Yvon kill, why does his daughter die, why does he confess? ), for each of these locates us in a relation of intelligibility to the film. In other words the film performs the same asymmetric relation between itself and us as is represented within the film between Yvon and the world. This is the textual model of prayer and while we certainly don’t need to be Catholic to understand this it is probably important to recognise that this is the disposition of these works. 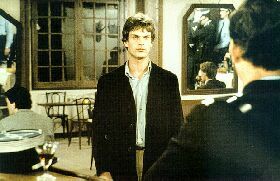 On the other hand, there is something cinematic that Bresson has discovered, and L’Argent is perhaps one of the simplest expressions of this. The practice of religious art has always privileged what can be characterised as poses, representations that carry the force of being ‘distilled’ moments – the crucifixion, Madonna and child, and St Anthony’s agony for example. These instants, as distillations, fall outside any simple temporality, so they are a bit like posed photographs, though we understand that unlike the photograph, they are unposed – sacred snaps (we don’t ordinarily think that Christ struck a pose while being crucified). Cinema as a modern technology is composed of many simultaneous images, most of which are moments that don’t of themselves carry the import or distillation of the pose, what Gilles Deleuze has described as “any-space-whatevers” (1). What Bresson does is to take these two possibilities and combine them, so that within the indifference of the everyday he ‘makes’ poses. These are Bresson’s hands, doors, feet, the rarefied backgrounds and even the soundtracks. Within these a ‘major’ pose will always emerge; Yvon’s weeping, confession, the woman awaiting her death, Yvon’s attack’ on the guard, but these poses while derived from the quotidian, point past the quietude of what is already in the world. These poses – just think of the hands in L’Argent – represent spaces that have become singular. They are separated out from their surrounding space, so the image’s relation to other images, what can come next, is now freed from the ‘rules’ of continuity editing, it can be any space (any location, any event). In addition, once what produces the image of the hands is no longer the flow of movement defined by a before and after, an intensity is produced in the image, a quality that is, precisely: the pose. For Bresson this achievement is religious in intent, a revealing of the sacred within the profane. For L’Argent the question and mystery of the sacred is not merely limited by the unknowability of grace, but applies equally to the intelligibility of evil: what does it mean to choose evil when indeed there is choice? Gilles Deleuze, Cinema One: The Movement-Image, Hugh Tomlinson and Barbara Habberjam (trans), University of Minnesota Press, Minneapolis, 1986.